Freediving has become a mainstream idea and more and more people are trying this amazing adventure sport every day. There is a wide range of interest, with numerous opinions on who can do it and who can teach it. On one end of the spectrum, some people feel it is not for them, that they cannot do it, or that it means diving to extremely deep depths. On the other side, there are many deep divers and instructors in the sport that have become almost snobbish about the activity. They feel that Freediving is a deep-only sport, that only "the great" should be doing it, and the super elite should be teaching it. In my opinion, both are wrong. Freediving is for everyone. Guess what? If you can hold your breath and equalize your ears, you have what it takes to learn to freedive. Many instructors would hate to hear me simplify it to such a degree, but in reality, that's all it takes to be able to freedive. It also helps to have the desire to learn new skills and to challenge yourself! Freediving is an amazing activity that almost everyone can enjoy, and many can excel at. Just like any true sport or activity, it requires practice, focus, and training. Taking instruction from a professional will obviously increase your ability, teach you the proper techniques, make it safer, more efficient, and ultimately more fun. I originally started freediving to go spearfishing. I had never taken a course, but was pretty good at it. After years of freediving on my own, loving the water, and finding my place in the world, I became a PADI dive professional. Once I was a scuba instructor, I wanted to finally take a formal freediving class to see how much it would increase my potential, and see how much it would affect my freediving. I found that taking a class showed me techniques I never knew. It helped me hone my existing skills, and definitely helped me achieve deeper depths for longer periods of time. 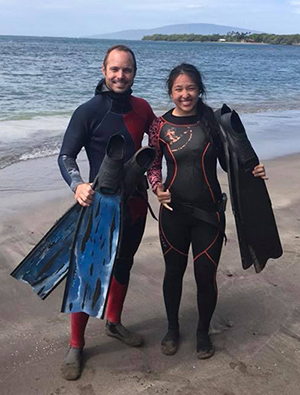 Since then, I have had further training in freediving, continued to refine my skills, and I have become a PADI Freediving Instructor in addition to being a PADI Master Scuba Diver Trainer. I personally am not trying to reach 300 feet and I don't always go freediving to hit new records. I love to enjoy the underwater world and its inhabitants in silence and peace. I love to dive within the 40-120 foot range and revel in the experience. I hunt at those depths. I know the proper techniques to descend to deeper depths, and have done so in the past, but by no means am I trying to beat anyone's record or consider myself a Master World Class Freediver. I’m just trying to enjoy the ocean and be better and more consistent than I was on my last freedive. I learn something new about myself, and the dive EVERY SINGLE TIME I make a drop. I love to freedive and I love to share my passion and love for the sport. 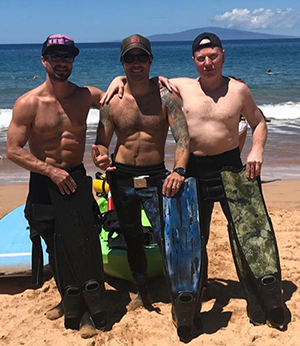 Being a freediving instructor doesn't mean that the instructor is the greatest freediver in the world, or that he or she can hit 300+ feet. It means that they have the knowledge, experience, techniques, and training to teach you to freedive to deeper depths, and to do it safely, efficiently, and consistently. Just like in every sport, there are different levels of teaching and participating. As in every sport, the greatest coaches aren't necessarily the greatest players. Being a deep freediver does not correlate to being a good instructor! 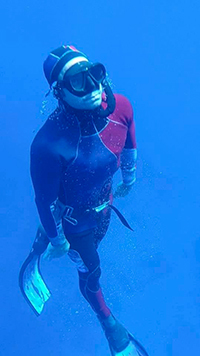 Being a great instructor doesn't mean you're a world class, record breaking freediver. It means that you care about your students, you have a passion for the sport, and you have the training, skills, techniques, and knowledge to pass on to your students. I truly enjoy teaching others to freedive. There is nothing better, as an instructor, than seeing someone take themselves to a place they never thought possible. The ocean is a magical place that every person should enjoy and be a part of, even if just for a moment. I teach with the mindset that my students can easily be better than I am. I hope to give them the confidence and techniques needed to improve, excel, and continue their underwater exploration. Freediving isn’t about depths and numbers! It’s about a personal discovery and self exploration. It’s about taking a magical free fall into the most incredible place in the world, the underwater realm. I have seen the most incredible sights at 10 feet deep and have plummeted to 150 to find an empty space of wonder. Both depths are freediving, both depths can be filled with incredible experiences. I KNOW that most everyone can freedive. The difference between a freediver that dives to 60 feet and one that hits 300 feet is a better diving reflex, and advanced equalization techniques. Both can be learned through proper instruction and practice. There are amazing divers and instructors out there. There are several agencies that teach freediving. I am a proud PADI Instructor and love to teach the PADI Freediver Course. PADI is definitely the most conservative agency of them all, and the one that teaches the most courses in diving. PADI focuses on teaching recreational freediving, while learning all about the sport. They focus on exercises and skills to help you become a great freediver. And as you progress through the levels, you learn more about the sport, the gear, and the techniques used to reach deeper depths. We teach Basic, Advanced, and Master level courses. We focus on technique, individual progression, and safety. We teach a standardized, scientifically proven methods, individualized by every instructor. Each instructor brings their wealth of knowledge and experience to help teach you how to freedive safely, achieve better breath holds, reach consistent deeper depths, and have a blast doing it. We are all teaching the exact same information and techniques, and having the students perform the same exact skills. We do not focus on deep deep depths or on quick progressions. We stress technique, safety, and dive skills. No matter the organization you choose or level you want achieve, I truly hope you take a freediving course and experience the underwater world in its purest form. Take yourself to where you thought you couldn't go! It doesn't matter how deep that is, but I guarantee it will be far deeper than you think. I love scuba diving, but freediving allows me to experience the underwater world in its true silent beauty. In turn, it has made me a much better scuba diver, giving me true underwater confidence and composure. I would love to share my passion and love for this sport with you, and show you that you too can be a freediver. You too can take yourself where you never thought possible. You too can explore the silent underwater world, because Freediving is For Everyone!